5-27-12 Oconee Connector �Mega Shopping Center � Boon or Traffic Jams? Epps Centre sounds like a positive economic development for the county. However, it will serve to dump more traffic onto curvy Jennings Mill Road and two-lane Mars Hill Road. The connector and bridges were planned to allow traffic to circulate in the area without getting off and on GA 316. We wanted to avoid the �Mall Mess� but now we may be facing �Melvin�s Mess�! 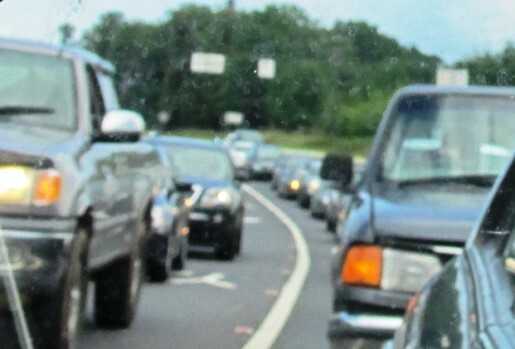 Oconee Connector –Mega Shopping Center – Boon or Traffic Jams? The Oconee Connector was a good idea. It was developed in the 90’s by Peter Mallory, GA DOT and me as Chairman of the BOC, and others. The Mars Hill Corridor Parkway project was planned to be built first and should have been started around 2002-3. Chairman Melvin Davis was instrumental in switching priorities and allowing the connector to be built first thus putting two-lane traffic onto existing two-lane roads. The new Epps Centre sounds like a positive economic development for the county. However, it will serve to dump more traffic onto curvy Jennings Mill Road and two-lane Mars Hill Road. The connector and bridges were planned to allow traffic to circulate in the area without getting off and on GA 316. We wanted to avoid the “Mall Mess” but now we may be facing “Melvin’s Mess”! The sidewalks etc are nice. However, they need mowing and maintaining. At this time, they are growing weeds. The County must provide resources for this type maintenance. Economic Development, Public Safety and Recreation are all important but so is a good transportation system, litter free streets etc that appeal to businesses that are looking at Oconee County. Hopefully, vision and better planning will have more influence than Developers on future county officials. We can do better! Mayor to DOT: Are road projects frozen or not? Athens-Clarke Mayor Heidi Davison on Thursday asked state transportation officials to make up their minds - are future road projects frozen or not? Davison said she was confused recently when DOT officials green-lighted more construction money for a new road in Oconee County, just weeks after saying they were shifting projects and narrowing focus because of a budget crisis. "This is not about Oconee County, and it's not about the project. It's about fairness," Davison said Thursday at a called meeting of MACORTS, the tri-county transportation planning committee. Though the committee later voted unanimously to increase the Oconee project's budget to $ 26 million, Davison and another MACORTS member, Lucy Rowland, said they'd like a letter from DOT officials explaining exactly what "frozen" means. Rowland also called the circumstances of the special meeting, which quickly was scheduled last week, "strange." "I don't recall something coming in like this (in the past)," said Rowland, a longtime MACORTS member and current chairwoman of the Athens-Clarke County Planning Commission……..
…….We wanted traffic to and from this commercial node to be able to access businesses without having to get on and off GA 316 or the Epps Bridge Parkway. It was Oconee’s attempt to avoid the ‘Mall Mess” on Highway 78 in Athens-Clarke County…. The DOT on Tuesday launched a Web site detailing $ 7.7 billion worth of projects that had been slated to begin construction or study sometime in the next six years, but have been lopped off the department's priority list. These are local road projects the state Department of Transportation has delayed because it does not have enough money for future improvements.